"Spring Reign" is what they call it, but this year "Winter Deluge" might have been more appropriate. 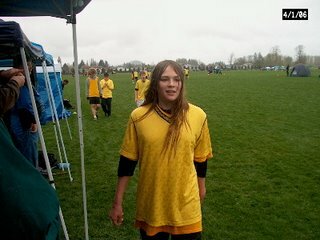 This is the world's ultimate Ultimate Frisbee tournament, attracting teams from as far away as Alberta, Canada, Northern California and Billings, Montana, 56 of them to be exact, in a 2-day feast of food, fun and coping with fickle Northwest weather.. Younger daughter Savanna and I arrived at the incredibly expansive Burlington site next to the Skagit River early Saturday morning. It was raining. It was blowing. The temperature was in the low 40s. It was good weather for soccer, but very bad weather for throwing a 175 gram disc. After checking in at the official headquarters, we plotted a course for our field. Unfortunately, we forgot to bring our GPS plotter and field glasses, but after what seemed to be some kind of vision quest, we did hook up with our teammates, who were huddled under a white and red awning, resisting the coach's plea to take the field and start warming up. At 10am sharp, the first of the three Saturday games began and despite the inclement conditions, the game went well, with the good guys (the Whitman Wildcats) winning 13-0. The second and third games went a little less-well, with one blowout to a team that included some high school players and a close loss to a very good private school from Tacoma. The kids played great for all three games and seemed to be enjoying themselves despite the near-impossibility of staying warm or dry. After the game Savi and I checked into our motel, where she hooked up with some of her teammates. A bunch of us went out for dinner and when we returned to the room at about 8, we were so tired that we just watched TV for a couple hours and went to bed at 10. Thanks goodness the rain stopped sometime during the night and Sunday morning found the conditions much better. We got to the fields at about 9:30 and again started our first game promptly at 10. Because of the results from yesterday's games we got into a difficult bracket, but the kids held on to a win a very tight match. The second and third games were also very close, but both resulted in tough losses against very good teams. With the exception of one game, there were five matchups that were very close, with the average margin of victory being somewhere between two and three points. The games were exciting and fun to watch and they all lasted close to the 90-minute time limit. I think most of the kids had a great time, especially on Sunday. The tournament was very well organized with lots of food, and the weekend just sort of flew by. In the spirit of Ultimate Frisbee, where good sportsmanship is part of the culture and co-ed play is mandated (each team must have three girls and four guys), a lot of friends no doubt were made. Savanna, as usual, was one of the star players and made several spectacular sliding catches and was the top scorer for the Whitman team. Along the sideline, she earned the nickname "The Claw" for her uncanny ability to make difficult one-handed snags. She also won two "Spirit Disks" which the opposing team awards to players who show exceptional sportsmanship and enthusiasm. Hey, seattlefrank, you've made the Big Time. A spam comment! From my observation of her play last Saturday Savi well deserves her nickname of "The Claw"